In this essay originally published in Wired online, Issue 11.10, October 2003; Richard Dawkins explores the start of the Brights movement. How is a meme created? You can sit back and observe the spread of a new fashion, a new slang word, a new way of walking or talking - and let a meme burst onto the scene in its own good time. An example would be the current epidemic of basically, which, as a synonym for er, has infected a ludicrously high proportion of sentences now uttered by English speakers. But the ultimate test in science is experiment: You don't just wait for something to happen and observe it, you make it happen. The gay meme improved the image and, I dare add, the happiness of a once unpopular minority. Similarly, bright is intended to come to the aid of another beleaguered community in the US: those who, in the most religiose country in the Western world, have no religion, who are variously labeled atheists, agnostics, freethinkers, philosophical naturalists, secularists, or humanists. A Gallup poll in 1999 asked American voters the following question: "If your party nominated a generally well-qualified person for president who happened to be an X would you vote for that person?" X took on the following values: Catholic, Jew, Baptist, Mormon, black, homosexual, woman, atheist. Six out of the eight categories secured better than 90 percent approval. But only 59 percent would vote for a homosexual, and just 49 percent would vote for an atheist. Bear in mind that there are 29 million Americans who describe themselves as nonreligious, secular, atheist, or agnostic, outnumbering Jews tenfold and all other religions except Christianity by an even larger margin. The same questions had been asked by Gallup in 1978, and there are revealing differences. In 1978, only 26 percent of the American electorate would contemplate voting for a homosexual. Is it possible that the word gay, and the gay pride movement that came with it, has been partly responsible for the improvement to 59 percent by 1999? If so, all the more reason for the despised 29 million to seek their own "gay." I am a bright. You are (quite probably) a bright. Most of the people I know are brights. The majority of scientists are brights. Presumably there are lots of closet brights in Congress, but they dare not come out. Notice from these examples that the word is a noun, not an adjective. We brights are not claiming to be bright (meaning clever, intelligent), any more than gays claim to be gay (meaning joyful, carefree). Whether there is a statistical tendency for brights (noun) to be bright (adjective) is a matter for research. I would dearly like to see such research undertaken, and I know the result I am betting on, but it is no part of the definition of the noun. 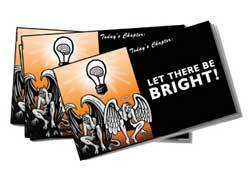 The noun bright was coined in March by Paul Geisert and Mynga Futrell of Sacramento, California. In April, I heard them give a presentation on the new word in Florida, and they launched The-Brights.net soon after. The new meme was almost immediately given a boost by two enthusiastic articles in large-circulation newspapers. On June 21, I wrote "the future looks bright" for the Guardian, one of Britain's leading national dailies. And on July 12, the distinguished philosopher Daniel Dennett followed up with "the bright stuff" for The New York Times op-ed page. So, the bright meme is launched. Will it spread, like gay, and basically, and the backward baseball cap? Or will it nose-dive into the sand? I'm hoping it will take off. I'm even betting that it will, despite the hostility of those who misunderstand the humble noun as an arrogant adjective, and those who, notwithstanding the success of gay, resent all such coinings out of hand. But mostly, I am simply curious, as a disinterested scientist, to see what will happen.